These are the two surf boards I still have, even though it's been a good while since I've had the opportunity to ride them. Both are over forty years old. 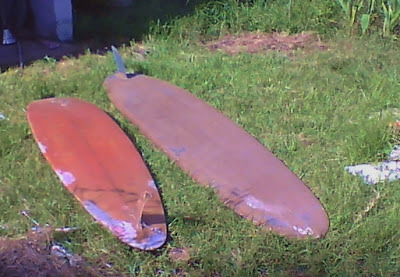 The brown one (that's a later skin I added -- it used to be blue) is a first generation 'short board,' circa 1967. Most likely cut down from a longer board. Quite a few 'obsolete' long boards (for which folks would pay plenty now) were reshaped at the factory or by owners. It's 9 feet long and pretty darn heavy, with a slightly rounded bottom. The red one is a 7'2" Rick from '69. The 'Radical Rick' as my surf buddies called it, ski nose, hard down rails, flat bottom, deep V at the tail. I could not ride it properly at all when I purchased it but when I got back on it a few years later, I found that I really loved it! It looks like it should be a big wave board (it is 'gun'-like) but actually excels in surf of relatively modest size (but with a bit of power). Part of the reason I liked it better later -- aside from being more experienced -- was that I had largely switched to surfing left-handed ('goofy-foot') which is more natural to me. I seem to be a righty purely by training. I've had other boards since -- including a half-dozen I built myself -- but they all eventually deteriorated beyond usability, so these are what's left. Note that, unlike the typical modern board, they have only ONE fin. No trainer wheels for Steve. Actually, I rode a thruster (tri-fin) briefly when they first appeared. Never liked the feel of them and I detest the modern style of surfing, all flat turns and skate-like. Where's the power? That includes the popular concave bottom which essentially loosens up the board for moving quickly side-to-side -- not for 'channeling' the water flow, as is sometimes claimed -- but is less well suited to hard, on-edge turns. Instead, the modern surfer tends to pivot on his inside fin and then pump side-to-side to try to build up speed. A traditional turn on the rail channels the power of the wave to create speed. But enough complaints. If that's what them darn kids want, let 'em have it. It does make it hard to find an 'off-the-shelf' surfboard that is quite what I would want...and I'm not about to lay out money for a custom job at this point. I need to get back into the water on something versatile and inexpensive before I think about that! So I finally ordered one. A long board, of course, for riding the little waves down at Panama Beach if and when I can get there. Epoxy, for durability. Hand-shaped, not molded -- I'm only willing to compromise so far on quality! Stock design, but with the bottom and edge shape I would more-or-less prefer. I went pretty conservative and chose to go somewhere between a full-blown traditional 'log' and a performance design. Alas, it does have three fins, but it is the sort with one big fin in the middle and two smaller ones, all removable, so I can and probably will dispense with the outer fins. I do not think they will add anything to this board's performance. I'm hoping to get out in the Gulf and try it within a reasonable time frame. Or out in the Atlantic for that matter...or the Pacific...oh, heck, why not an Endless Summer trip around the world!